Last week was NCAA Championship week — for soccer at least — with both the Men’s and Women’s Division I National Championships taking place. while ben spea’s cracking winner was enough to win unc its 2nd national title, it wasn’t enough to change my overall perception of the match feeling foreign. Both were shown live on ESPN2 during (relatively) desirable Sundaly timeslots, yet another milestone in soccer’s slow and steady progress to mainstream acceptance in the States. The men’s final pitted a popular, perennial contender in UNC taking on a genuine Cinderella in the un-fancied Charlotte 49ers. Meanwhile, the women’s final featured two well-known favorites duking it out at the gorgeous Kennesaw State Soccer Stadium. And as far as the play was concerned, both matches were entertaining affairs featuring sides willing to play attacking-oriented footbal. On the surface, the finals were a winning combo for NCAA athletics and soccer alike. That said — and I don’t know about the rest of you — my experience of the matches was one of confusion. To me at least, each final barely felt like a soccer match. Why? The NCAA-sanctioned laws of the game made the finals drastically different from the professional matches I watch week-in and week-out. Hell, I even played NCAA soccer and I was still thrown for a loop. From count-down clocks that the referee can sometimes stop with the blow of a whistle, to quasi-unlimited substitutions, to freaking mid-half TV timeouts — TIMEOUTS?!?!?! — I was left feeling like I should be questioning what sport I was watching. I knew I was watching soccer, but it was some strange, Seinfeld-esque Bizarro World form of it. Sure, there was still football being played. The mechanics and play of the game were still the same. But for a seasoned soccer fan such as myself (I’m assuming you also fall into this category), I felt like I was being treated to a bastardized version of the game I love. At this point, you might be asking yourself, “How did we reach a point where soccer has been so Americanized that it made it an unenjoyable viewing experience in the first place?” at least I am. And if you’re not thinking that, it could get a little awkward, because the rest of the article is centered around the entire concept. So fair warning. 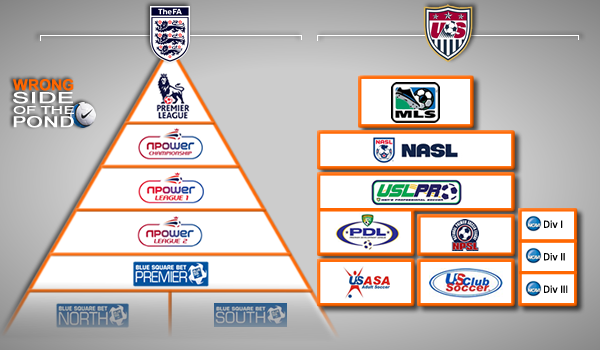 Anyway, the easiest place to start is to examine the structure of the American soccer landscape. Which, by the way, just so happens to be a unique beast when compared to its counterparts around the world. In most developed nations, the game is organized into a neat and tidy pyramid. There’s a clear progression from one level to the next, with teams and players able to climb up and down the ladder based on their capability and resources. While each has their own codes and laws to abide by, they’re all governed by the same overarching system. The system here in the U.S. is drastically different by design — much like how most everything in America is inherently obliged to be. We not only have multiple, overlapping pyramids in our developmental structure, but in most circumstances, there’s no singular entity to which every piece of the structure must answer. Because of this, we end up with a number of odd variations of the game based on differing codes and laws that each have adopted. A lot of the blame for soccer’s differentiation in governance in the US is due to the way that most traditional American sports are structured in this country. Unlike in Europe and South America, where athletic clubs and academies are the norm, young athletes in this country will typically receive most of their early training in recreational environments. From there they progress to playing for their high schools, and then eventually on to playing at the collegiate level(s). The lucky talented few are then drafted onto the worst of their sport’s respective professional league’s teams… which is a process that also helps to produce botched, complete wastes of talent. We’ve had to awkwardly back-build a professional soccer pyramid on top of this existing structure, adjusting and modifying the plans as we go. In several circumstances, these adjustments have caused confrontations — fueled on by each party’s own differing senses of entitlement and interpretations — which have lead to the splintered, disjointed American soccer pyramid that we see above. The effective end result of this is a hodgepodge of rules that further complicates our country’s push at developing a distinctive playing style of its own. Each set of rules and regulations usually ends up favoring a particular playing style and tactical approach. This becomes extremely problematic when players coalesce at the next stage in their careers, each with their own unique understanding of game play based on the route they took to get there. The managers at this level are, consequentially, stuck with arduous task of starting from square one, attempting to build a unified understanding between all of their players. As it currently stands, the collegiate soccer system is the de facto farm system for our professional game (Tangent Warning: Our reliance on the college system is slowly being replaced by the Youth Academy system. But, we’re still a generation of players away from being able to rely on that as heavily as we rely on NCAA programs to produce our current pro’s). The problem with that is the NCAA’s governance of the beautiful game is so completely different from that of rest of the world, it’s actually become a major hinderance in the development of the sport in this country. First overtime period: no re-entry. A.R. 3.5.1.b. A player does not start the second half but later enters the game and subsequently is substituted for. May that player re-enter the game in the second half? RULING: Yes. First overtime period: One re-entry. What the hell!?!? One hundred and six words were needed to write something that I can explain in six for most other leagues’ rules: “Three substitutions per match; no rentry.” Someone had to sit down and determine that this was the best solutions for giving team’s substitutions? I get that they don’t want to go full tilt and outright ban re-entry and allow for more than 3 subs, but I would have to think it would be easier to just allow for straight unlimited substitutions instead of following a confusing set of circumstantial laws. That’s not to mention how hard it has to be for the referees to keep track of everything, like those guys need something else to make their job harder. the mid-half TV timeouts seemed to breath life into stanford in both halves of their 1-0 win over duke. would the momentum have swung in their favor without them? But, how does this end up affecting player development? To truly wear the other team down, it will be even more effective if the side adopts a more direct, long ball style where the other side is forced to chase on top of dealing with fresh legs. Let’s ignore that this is a hideous form of the game, and instead focus on who this hurts. By skipping over them with this method, this can seriously stunt the development of skilled midfield players that have become so vital to the modern game. Without as many touches on the ball game, and with limited game experience, those positional players are bound to suffer. Rapid fire substitutions can prevent players from adjusting to playing full, 90-minute matches. Considering the rest of the world typically follows the standard FIFA substitute rules, they might want to get used to not getting a mid-half/game rest. By these rules, you’re allowed to sub a second half starter out, give him a breather, and then put him back out there for the man that just replaced him. By doing so, what kind of confidence is a coach instilling in his substitutes if he only gives them 10 minutes to shine? Can a player really catch up to the pace of the match in a 10 minute cameo? Rapid fire substitutions, or line changes for that matter, tend to kill the flow of a game. Players will generally play better together the more time they play with one another, thus improving the quality of play and their understanding of the game. Plain and simple, none of those hypothetical outcomes do anything to prepare a college player for the professional game. In fact, they do quite the contrary. Apparently, USSF is content to continue to twiddle their thumbs while the primary producer of its professional players fosters an environment that undermines their organizational goals. And let’s not forget that the potentially overboard analysis above was for just one of a number of rules that are unique to the NCAA. I haven’t even made mention of the ridiculous offseason training rules restricting not just friendly matches and scrimmages, but also the number of days a team can train together. Imagine how easily the impact of the average player’s development when trying to make the jump to the next level. What we need to do is ask ourselves what purpose these rule differences actually serve. Will allowing unlimited subs help prepare players for the professional game? If no, then scrap it and adopt the FIFA rule. Does severely limiting the amount of scrimmages a team can play in the spring produce better teams, players and competition. Of course not: in fact it makes all of those things worse. If a rule actually benefits the players and serves a purpose, I can accept it as a permissible change. Give me a good reason and I’ll hear it out, I promise. To what end do these changes work towards? Better students, perhaps. But not better athletes. I’m just hoping that there’s a reason for all of this. And screwing up the laws of the game — and our chance to develop proper players along with it — just for the sake of being American, doesn’t seem like reason enough to me. This is a really good article for explanation purposes. Your knowledge of the rules and the game is excellent and extensive. However, the goal of the NCAA is not to develop athletes for the next level. The objective is to provide students the opportunity to play a sport at a high level while they get their education. The percentage of athletes that go pro in a real world job is MUCH higher. The reason for game dates in the spring, less training time, etc., are there to protect students’ ability to actually go to class and get their education. Athletics is supposed to be second. I want soccer in the U.S. to develop just as much as you. Personally, I think the way to go is not to tweak NCAA rules (although that is needed in some areas, of course). I believe that MLS, NASL, USL teams need to provide educational opportunities to younger players. That way a player that doesn’t make or obtains an injury can still have a life after those few years of trying to become a professional.